I can't believe it's been a year already but here it is, November again and for the second year Passports With Purpose is organizing their creative and inspired drive to raise money for a cause; last year they built a school in Cambodia and this year the goal is to build an entire village in India, brick by brick. Here's how it works: bloggers like me procure a prize, blog about it and spread the word. We hope our readers will go to the Passports With Purpose prize page and make a donation. Each $10 you donate will put you in the running for a prize of your choice and there are some great ones from plane tickets to travel gear and stays in resorts. Each $10 you donate also goes directly to building the village in India so it's a winning formula all around. 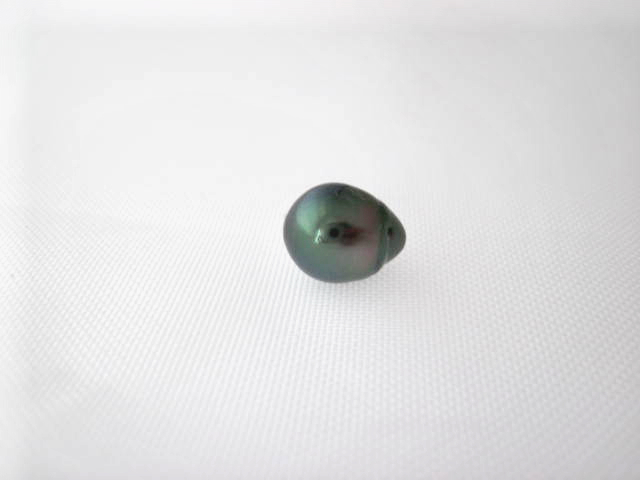 Once again my contribution is a Tahitian pearl, generously donated by Kamoka Pearls, where I worked for years and it's still run by my family. Last year I entered a silver toned round so this year I'm upping the ante as far as my own tastes are concerned and am offering this gorgeous A-grade teardrop peacock green 10.5mm gem in the photo. This pearl comes from my private collection of some of the most beautiful pearls the farm has ever produced. Retail value is probably around $250 but really it's worth more than that - it's rare to find a pearl this pretty on the market anywhere. It would make a stunning pendant. Note: the black in the middle of the pearl is just a reflection of the photographer, not a blemish. I stop at the fortune teller's curtained off street stall to ask how much a fortune costs, not because I want to learn anything about my future. I'm intrigued that there's still a booth here at all amongst the fridge magnet and watch sellers of Melaka's increasingly commercial Jonker's Walk Night Market. But before I can even open my mouth, a middle aged Malaysian man whisks me over to sit at a table; unless I rudely get up and walk away, I'm suddenly committed to paying for whatever it is he's offering. 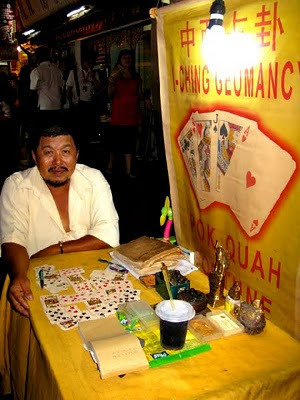 “It's 15 ringgit,” he tells me in a friendly voice as he shuffles a worn, damp looking deck of cards. Fifteen ringgit (about US$4.50) is kind of steep for Melaka – that's two meals, or a tourist T-shirt and a half back out in the market - but, I'm already sitting here so I'd better make the most of it. Bring it on. I pick one, it's the nine of spades. He spreads the other cards out in a circle and grabs a photocopied form with some charts on it. At the top I read his name: Ah Chan Koon (Master). He scribbles five numbers down a column then writes down months to which they correspond. He works fast, time is money and he's on automatic pilot. I tell him and he takes out a book to find my Chinese sign. I'm technology-challenged and I get queasy at the sight of blood. He writes down more stuff on my chart including lucky numbers and colors then reads my palm. I'm happy to learn I'll live to 100 but not so happy that I'll have six children. Lastly, he asks if I have any questions. This is surely where I could get my money's worth but my mind is blank, probably because I never wanted to know anything about my future in the first place. So ask him what I really wanted to know: is he the last fortune teller at this night market, where just a few years ago geomancers such as him were such a hot item? “Yes, it's just me now,” he says. This makes me a little sad and I thank him, pay him and ask if I can take his picture. He's happy to oblige and we smile and shake hands as I leave. I weave my way back through the throngs of Singaporean and Malaysian tourists, the occasional Western head popping up through the crowd, past the trinkets and knock-off Crocks vendors that extend almost twice as far as they did the last time I was here a year and a half ago. The night is lit by bright lights coming from the stalls and the neon of shop fronts, it's hot and muggy and the air smells like fried food. 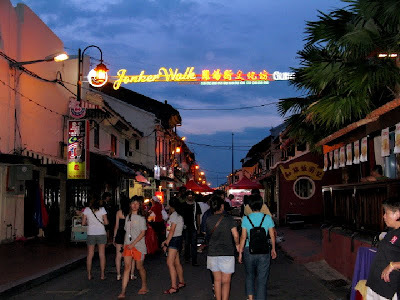 I don't feel like I know much more about my future but looking at how this place has grown, I can't help but forebode that Melaka's quirky seers, artists and antique dealers will increasingly be pushed out by all these plastic sandal and potato chips-on-a-stick sellers. 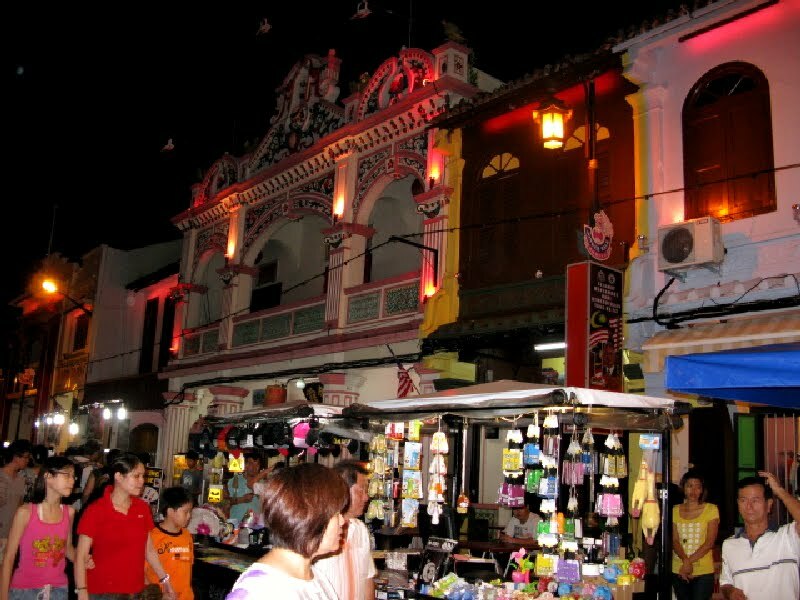 Ah Chan Koon (Master) might not have told me a fortune that I find useful, but if my 15 ringgit helps to keep his booth on the night market strip and preserve the soul of this town, my money is well spent. Hopefully though my predictions are as flimsy as his – there's no way I'm having six kids so let's hope that it's equally unlikely that Melaka will loose its last signature fortune teller to cheap gadgets and quick commerce.